With Christmas fast approaching you are probably looking for fun toys that will encourage your kids to stay active even during the cold winter months. Rockin’ Rider ponies by Tek Nek Toys combine imaginative play with physical activity. Children can enjoy hours of fun on the Rockin’ Rider while Mom and Dad save some cash this Christmas season. 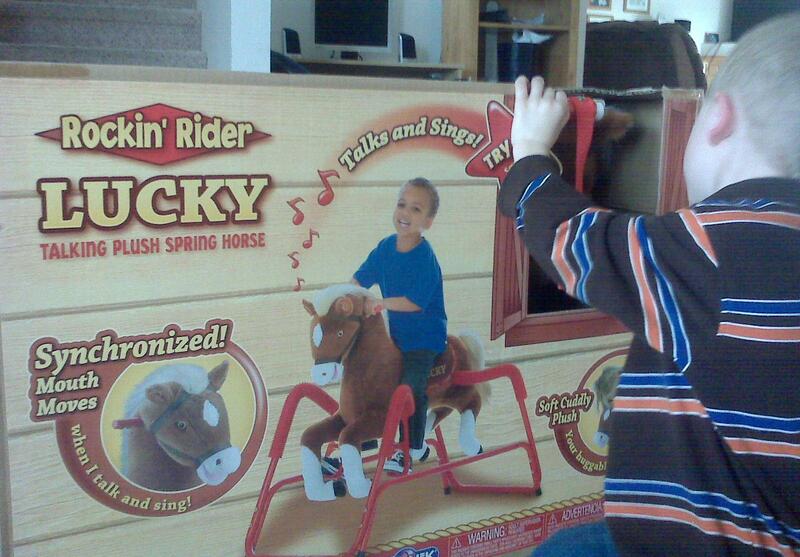 My children (ages 2-5) love playing with “Lucky” the deluxe talking plush spring horse. When it arrived my two sons got excited and anxious for Mom to put it together. Assembling the pony was simple and only took about fifteen minutes. 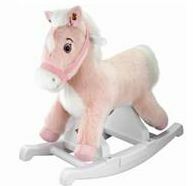 “Lucky is motion-activated and makes realistic sounding galloping noises and sings the song “I’m a Little Pony,” written by award-winning song writer Jim Coffee. 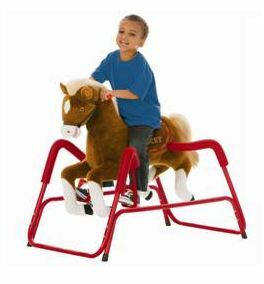 The horse is soft and the base is strong and sturdy which is safe for children 2-6 years. My kids love “Lucky” so much that we have to make sure they take turns to avoid fights. I like the fact that it does not take up too much space in our playroom and it encourage my children to move their bodies to make him rock and bounce. Tek Nek Toys carries a wide selection of Rockin Riders. Their top selling talking plush rocker is ideal for children ages 18mo – 3 years. It comes in a variety of colors including their popular pink and brown. The synchronized mouth allows the horse to talk and sing “I’m a Little Pony.” These ponies also have easy grip handles, makes whiny galloping noises and has a sturdy plastic rocking base. The talking plush rockers are affordable and can be purchased at these fine retailers, AAFES, Duckwall, Kmart, Orscheln USA, Pamida, Toys “R” US, Wal-Mart and online at Amazon, eToys, Kmart, Target, Toys R Us, and Walmart. As part of our Christmas Wish List one Healthy Moms Magazine reader can win a plush rocker for their special little one from Tek Nek Toys. The winner can chose a pink rocker or a brown one. Participants are required to like the Rockin’ Rider on Facebook and Follow Rockin’ Rider on Twitter in order to enter. After that all you need to do is leave us a comment with your choice of a brown or pink pony. This contest is open to US residents only and ends on November 7, 2011 at 8am PST. For every entry including extra entries please leave a separate comment. Winners will be chosen randomly from the comments and e mails that I receive. The contest ends on November 7 , 2011 at 8am PST and is open to anyone in the US. Please leave your e mail address in your comments. All comments without e mail addresses will be disqualified. *Disclosure: I received “Lucky” the deluxe talking spring horse from Tek Nek Toys in exchange for this review. All opinions are accurate and 100% mine. I like Rockin' Rider on Facebook & am following them on Twitter as crackersmacker. I would choose the brown one if I won. Thanks for the chance! I like the brown pony. It would get lots of love at my house if I were to win. Oh I would love the little pink one for my granddaughter. I follow Rockin Rider via FB Bonnie W.
I'm following you via FB Bonnie W.
I like the brown pony. Note: I have tried several times to follow your blog thru GFC but it just gives me a sorry error. ??? Not sure how to post a link from Digg but I dugg this giveaway. I stumbled this post. I clicked “I Like it” and submitted. I would like the brown pony, please. I would love the brown pony and thanks for the giveaway. I “like” Rockin' Rider on Facebook and follow them on Twiiter. If I won, I would choose the brown one. i liked and followed and I would love the brown. what a fun idea! I like them on FB and follow on Twitter! I would choose the brown rider. I would love the brown pony! I subscribe to your Healthy Living Newsletter. I am a facebook fan of Rockin Rider (Marysa N), and follow on Twitter (Marysa1). I love the brown pony! I like Rockin Rider on facebook as Susan Chester and follow them on twitter as ptowngirl25. I would want the cute brown pony. I subscribed to healthy moms by email. Subscribed to Healthy Mom's Magazine! I follow Rockin' Rider on Facebook (Jenny 'Lemke' Anwar) and Twitter (jenny_anwar). Liked and followed! I like the pink pony! I would like the Brown pony! i would choose the brown one, we have a baby BOY on the way! subscribed to healthy moms magazine with google feeder! I would love the brown pony. Im following twitter and facebook @colleen_mouse colleen B. They are both cute – but I think the brown one looks more like a “real” pony! I like Rockin' Rider on FB (Sarah Smile) and I would choose brown. I'm a rockin facebook fan (pauline1501) and follow them on twitter (pauline15) and I would love the pink one! I like Rockin' Riders on facebook (Amanda Raih) and follow them on twitter (ra1hbread84). I would choose the brown one! Following RR on Twitter (JessicaSvitak) & Facebook (Jessica King) and I would choose Pink! I like Rockin' Horse on FB-Quanda & follow them on Twitter @Naddez. I'd choose pink one. I like the Rockin' Rider on Facebook and Follow Rockin' Rider on Twitter. Love the brown one. I am a fan of Rockin Rider via Facebook as Jill Myrick. I am following Rockin Rider via Twitter as jlsc123. I would love to have the brown pony. I am a Blog Frog member as Jill Myrick. If I was the lucky winner then I'd pick the brown pony for my son for Christmas. I follow rockin rider on twitter @lifesandcastle and facebook @ jenn mccullar. following rockin rider on fb and twitter, Id like the Brown pony! I would choose a brown pony. I follow your blog on blogfrog. I like the Rockin' Rider on Facebook and Follow Rockin' Rider on Twitter in order to enter. I like brown.